Lay half of the ice cream sandwiches (whole) in the bottom of a 9 x 13-inch pan, trimming the last couple to get complete coverage. 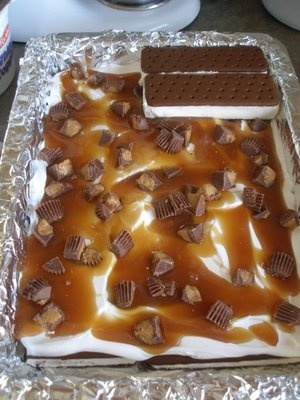 Top with half of the cool whip, half of the caramel sundae topping and half of the candy. Lay down another layer of ice cream sandwiches. Top with remaining cool whip and spread out evenly with a knife, making a lip around the edge so the sundae topping won't run out and over the edges. Top with remaining candy, cover and freeze for several hours (or overnight) before serving.